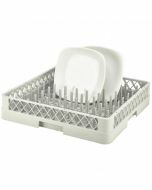 Heavy duty cutlery inserts with 8 compartments for commercial dishwashers. 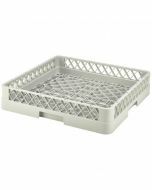 Manufactured from highly durable polyethylene to withstand high temperatures and erosion from detergents and chemicals. Ideal for use in all 500mm x 500mm standard commercial dishwasher baskets, with clip fixings on each side and feet to balance neatly on flatware racks.